You have likely heard the phrase “gross motor development” mentioned during your child’s parent teacher conferences, in a classroom newsletter; by your pediatrician or on a developmental checklist. Perhaps you’ve nodded along, understanding it to be an important aspect of your child’s experience in school and beyond, though remained unsure of exactly what it entails. Or maybe you’re well aware already! We hope this latest batch of bulletin boards will provide some information to those for whom this domain is unfamiliar, as well as enlighten those who already have some understanding. We faculty, too, continue to learn more about ways to expand our gross motor offerings to the children in our classrooms. We’re eager to share our ever expanding ideas: both to continue to enlighten you about your children’s experience, as well as to give you a few ideas you might be able to adapt for home and outside play! Gross motor skills refer to those which require whole body movement and which involved large, core stabilizing muscles that enable major body movement such as walking, maintaining balance, coordination, jumping, and reaching. The importance of these skills is obvious to bodily health, but their benefits reach into various other aspects of your child’s life. Engaging in rigorous physical activity, for example, allows children a real-life opportunity to assess and engage in risk-taking. This is imperative for their physical wellbeing and safety, but also as they move toward more independent decision-making and problem solving. Further, it builds a child’s self-esteem and confidence as they attempt and find success in various forms of bodily exercise. Crossing the monkey bars, traversing a balance beam, or leaping from high all give a child that glorious “I DID IT!” feeling. You likely have anecdotal experience that this elation breeds interest in taking on greater physical challenges: in this we can plainly see the development of the child’s intrinsic motivation and further steps toward autonomy through gross motor play. But gross motor play doesn’t just benefit the body and encourage one to try more rigorous forms of activity: it also offers more holistic gains for the child. This can certainly be seen in rough and tumble play, a type of gross motor play much feared and at times actively avoided by often well-intentioned adults, fearful of physical injury. In fact, when adults join children in rough and tumble play, they are offering a unique opportunity to develop their emotional intelligence. The Art of Roughhousing, by Anthony DeBenedet, expounds on these benefits. ; you can also check out his TED Talk on the topic to learn more. DeBenedet points out that during rough and tumble play, children begin to identify and manage their emotions; to begin to recognize when something is “too much”, and how to employ strategies for self-regulation. Further, they are pushed to recognize those same feelings in others, often by reading nonverbal cues, and to adjust their behavior accordingly. In this manner, rough and tumble play develops a child’s sense of empathy. Our classrooms are designed to incorporate purposeful movement into the children’s learning, as Montessori described. The mere act of “choosing a work”, in fact, demands a host of gross motor skills from the child. These are referred to as elementary movements, and are the first lessons provided to the child beginning in the Montessori classroom. To begin the work cycle, the child selects their work from one of several curriculum shelves, requiring the child to either squat to the bottom shelf or reach for the top. They’ll then need to carry the contents of the tray or basket ever so carefully so as not to cause anything to slip from the surface. On the trip to their chosen workspace, they must avoid countless obstacles: maneuvering around the mats of classmates working on the floor, or walking with their own trays, or seated in chairs. If they’ve chosen to work on a mat, they’ll need to reach across it to smooth it out on the floor. If, instead, a table is preferred for their work, they’ll need to pull out and push in their child-sized chair to allow for classmates to pass by safely. All this before they’ve even begun the task at hand! Many, perhaps most, activities and routines in the Montessori classroom require that the child attend to multiple steps before a work is complete, often in distant areas of the classroom. A child making a flower arrangement, for example, must carry a tray containing scissors, a pitcher, and perhaps a sponge, but must also add their choice of flowers taken from a larger vase and a small vase for his own arrangement. They must also fetch water from the sink, discard trimmed stems or leaves to the garbage can, and select a spot somewhere in the classroom for their completed arrangement. All the while and through all of their travels, they must maintain focus on the task at hand! Consider also the child as they clean up their lunch space: discarding food in the garbage, returning to get their cup to place in the dishwasher, and then their plate to wash at the sink! The child is building independence in self-care as they simultaneously complete a multi-step activity that tests their developing balance, motor planning, and strength! At attempt to instill muscle memory for future success in reading and writing is alive in the work of scrubbing a table. This Practical Life work provides innumerable opportunities for gross motor movement. The child builds strength and coordination is their hands by squeezing the sponge and scrubbing in counter clockwise, circular motions presented to mimic those used in letter formation. They develop balance and strength as they squat from the table to floor, where their materials are laid out, left to right, as in the words on a page. Likewise, as they maneuver through the classroom to the sink, soapy water bucket in hand. They cross their midline as they scrub the tabletop, moving meticulously from left to right. Table scrubbing has a clear purpose; to clean one’s messy workspace, but embedded below the surface are unparalleled sensorial experiences, indirect preparation for reading and writing, and, of course, an opportunity for the child to refine their developing gross motor skills. 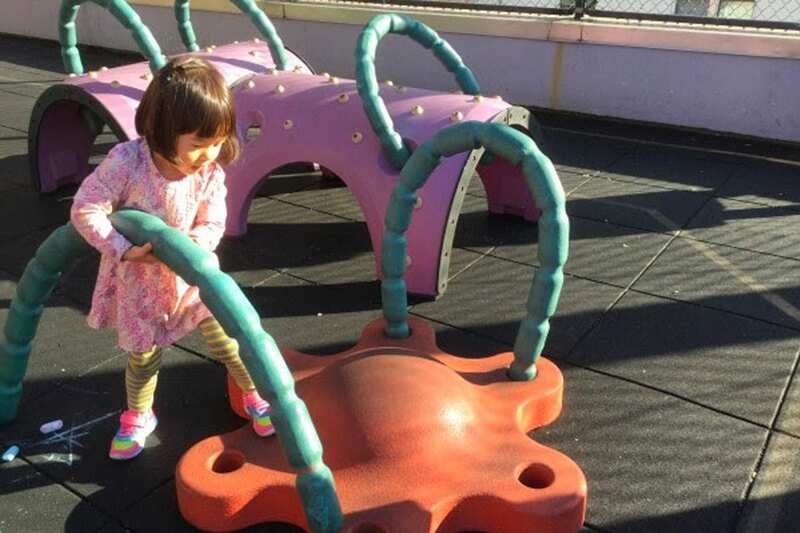 Gross motor activity often accompanies imaginative or dramatic play. Children frequently develop their creativity as they simultaneously exercise their bodies: can they avoid the hot lava surrounding them by jumping from rock to rock? Or evade a predator in hot pursuit by running at top speed? These types of scenarios are commonly observed in our gym or rooftop play spaces, as well as on trips to the park. Though running and leaping aren’t generally encouraged inside of the classroom, teachers do endeavor to provide the raw material for dramatic play activities that allow children the chance to exercise their whole body within the limits of safe classroom behavior. You might have noticed that our dramatic play stations often make use of our classroom stairs. A restaurant setup, for example, might separate the “kitchen” from the “seating area”, requiring wait staff to make several trips up and down the stairs as they take orders, deliver food, and clear dishes. What a workout for a child two or three, for whom activities that require maximum effort are of enormous appeal! For older children working to refine their sense of balance and move with increased precision, stacking a tray with dishes, glasses, and silverware is a “just-right” challenge. By offering children the opportunity to embody roles themselves, rather than simply providing figurines, we encourage them to get up and moving. Consider, for example, the play of acting out fighting a fire yourself, versus playing with a firefighter doll. What a difference! What physical skills do you find exercised in your classroom’s dramatic play areas? Is there anything more ubiquitous in the early childhood environment than an easel? It’s indubitably a fixture, and for good reason. Working on a vertical surface, like an easel or the large chalkboards you’ll find in each classroom at WSMS, engages a variety of gross motor skills. The child develops shoulder and elbow stability, encouraging strength and flexibility through the joints. The hand too is strengthened as the child extends their wrist, forced to work against gravity to make lines on the easel or chalkboard. Working in a kneeling or standing position at an upright surface also provides an opportunity to strengthen core muscles. Without a chair, slumping is an impossibility! That same thinking is at work in our presentations of finger painting, another activity integral to the early childhood classroom. Often, a finger painting table at WSMS is set without chairs. Further, the table is divided in four quadrants, with each space delineated by colored tape. Children are encouraged to spread out in their space, stretching and sweeping their colors from edge to edge in a full body sensorial workout as they explore color and mark-making! In addition to the movement that is naturally embedded in so much of the Montessori classroom, teachers at WSMS also work to individualize presentations with classic materials to create opportunities for further development of children’s gross motor skills. Faculty was recently treated to a workshop on this topic by Occupational Therapist and WSMS consultant, Becky Lewin. Becky expounded on our current practices by encouraging us to incorporate more movement into our existing presentations. Simple changes to the setup of a work allow children to engage completely different muscle groups and gross motor skills. In this spirit, we re-envisioned a classic Montessori transfer work, in which children place beads into each section of a segmented dish, beyond the typical confines of the tray. Imagine the muscle groups that come alive if the segmented dish were to be placed on the ground; or if the child were to work on the floor in a kneeling position, with one bowl to the left and one to the right. The variations are endless, and the faculty left the talk buzzing with new approaches to incorporate both class-wide, and for particular children in their groups.